With yesterday’s wide spread up candle, and this morning’s down bar, it seems we are possibly entering yet another period of consolidation for the usd to cad currency pair, which will either result in break above the strong resistance at 1.3000 and a move higher, or end in yet another failed attempt to break above this level. 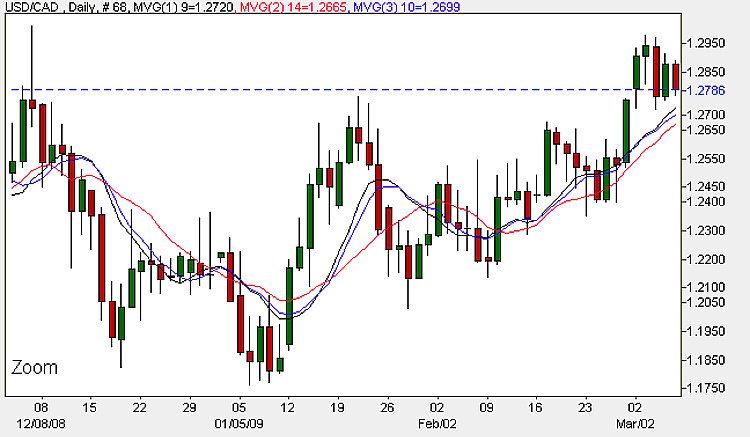 If it is the latter, then this would be the fourth failed attempt to break out higher. Having seen the wide spread up candle breakout from the consolidation below, I had assumed this would continue and that the momentum would be carried through and result in a break above this difficult area – this seems to have been a premature assumption, with the pair now struggling to go higher. Whilst the moving averages are all pointing higher, and have yet to be penetrated since the breakout, there is clearly an issue, with the bearish engulfing candle of Wednesday adding to the short term bearish tone. If prices do fall, then a break below the support at the 1.2650 level would be significant, as this would indicate a move back into the heavy congestion area, and yet more sideways movement, perhaps with more of a bearish tone than previously. Clearly the bearish signal of Wednesday was not confirmed on Thursday with a wide spread up bar, so the picture is very confused at the moment. My suggestion is therefore to take a wait and see approach, before entering the market again. The main fundamental news has just been released in the US with the NFP figures coming very close to forecast at -651000, against a forecast of -647,000. The latest currency news is available in the TV video channel with the latest prices on the live currency charts. The short term outlook is bearish, the medium term is sideways, and the long term outlook is bullish.